The original vision for Stockport Council’s digital transformation programme was to significantly improve the customer experience by embracing all the advantages digital solutions bring. As the programme has developed the focus has widened, with the result that the solutions we are creating may be digital, non-technical, or a mixture of both. Our current challenge is to transform the ‘Financial Landscape’ of the council. To help us with this project we are being supported by FutureGov, specialists in service design for public bodies. Here, Joseph from FutureGov describes the start of this project. 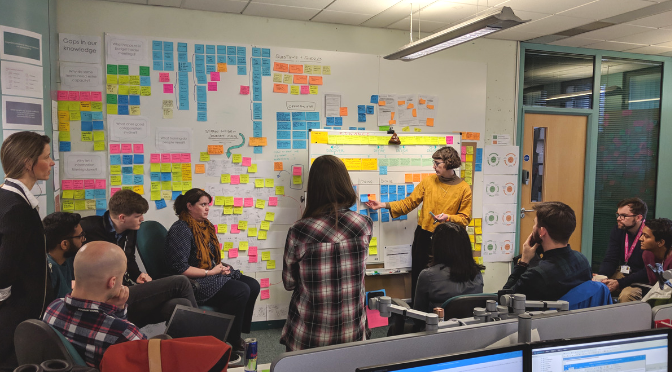 Building on the work that’s already been done by the Digital by Design team, we’re helping Stockport Council take human centred design approaches beyond digital, working together to design better end to end services for the citizens of Stockport. During our time together we will be looking specifically at how money comes into the council from citizens and how it flows around and is managed internally. We’ll be starting within one discreet area – Waste services – to prototype customer experience improvements and identify new ways of working to eliminate the inefficiencies we know exist. Digital is only one part of a service. Users experience a variety of different situations and touchpoints beyond digital when interacting with a council service, like receiving letters or working with staff. It’s important we view service experiences for people as a whole, rather than individual pieces. We’re developing a holistic view of a service. Joseph Bramall is a Service Designer at FutureGov. He began working with Stockport Council in January to support Stockport in creating better end to end services for citizens. If you would like to learn more about this work, please contact joseph@wearefuturegov.com.